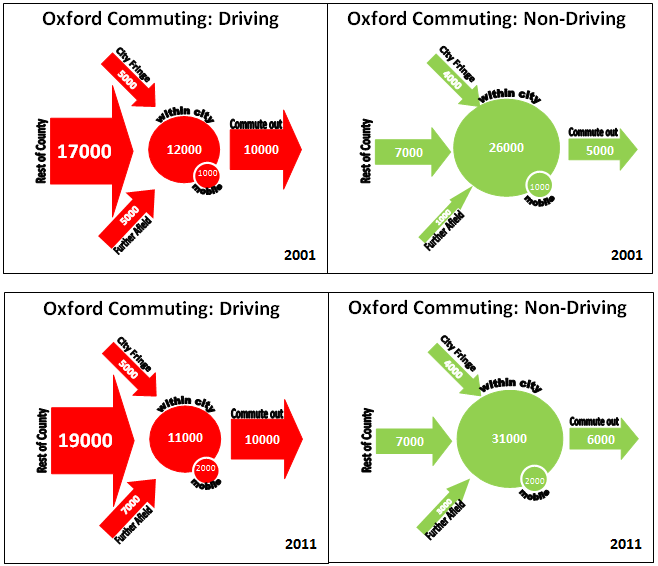 Driving Short Distances looked at the pattern of commuting within and into Oxford, using data from the census. The overall conclusion was that many car journeys are very short, and there was a strong case for making better provision for them to be made on foot or by bike. It was also evident that driving levels were lower where parking was restricted. Of the main routes that still have severe congestion, it was difficult to see how small improvements to public transport would be sufficient to get people out of their cars. People were coming from too diverse a range of places, and from too far away for bus to compete. Detailed data is now available for both the 2001 and 2011 census, so we can see how things have changed. What are the trends – which policies have worked, and what’s been happening despite the policies? The main change since 2001 is that more people are cycling and walking (+5000). There was also a reduction in driving to a specific workplace, but that was balanced by an increase in the number with no fixed place of work. Bus commuting has increased slightly. However, more people are driving from outside the city, from beyond the fringe. The roads are severely congested, as a result. Looking in more detail at internal commutes, there has been a dramatic reduction in the proportion driving to work in Headington (from 41% to 25%). The parking restraint introduced when the hospital sites were amalgamated has proved very effective. There has been an increase in commuting to Headington by bus (+4%pts), but most of the increase has been in cycling (+6%pts) and walking (+7%pts). Walking and cycling now account for more than half of commutes within Oxford to Headington. 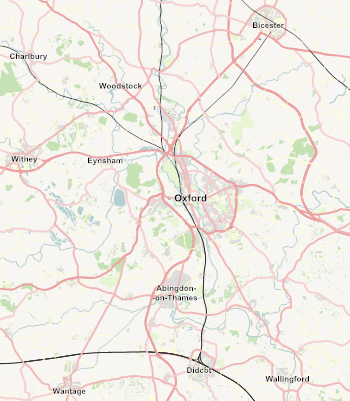 There have also been reductions in driving to other parts of Oxford (from within the city). However, the reduction was fairly small to workplaces in Cowley, and the level of driving remains much higher than for other parts of the city (44%). This reflects the lack of parking restraint in the Cowley area, and also the patchy state of cycle provision. The increases in cycling and walking have happened despite a lack of substantial improvements to provision; it seems likely that further increases would be possible with a little investment. More concerning is the increase in driving from further away: public transport has not been able to compete effectively. Something substantial is required, both to improve the public transport service, and actively discourage car use. In recent years, the County Council has focused on easing traffic flow at a number of ring road roundabouts. Occasionally some bus priority has been included in these schemes, but it has only been small-scale, and the overall effect has probably been to facilitate traffic growth. Rail services remain fairly limited, with only Didcot having a reasonable (half-hourly) service. Bicester services are currently suspended while the line is rebuilt. The line speed will be much improved, but the new service will only be half-hourly. Witney and Abingdon largely rely on bus services, which are frequent (every 10 minutes), but get stuck in the traffic. There have been various schemes mooted to improve the bus services, principally by providing bus lanes on the fast roads approaching the outskirts of Oxford (by widening the roads). This is expensive, not least because each route has to be done separately. With the volume of traffic, it’s hard to give buses a clear run through all the bottlenecks. The best overall result requires a clear route in for public transport, to maximise the transfer to public transport, and minimise the amount of car-congestion at the new equilibrium. So, how do we make a clear route for the buses from Witney and Abingdon? Perhaps the time has come to be radical, and to block one of the main roads into Oxford to through traffic. The short route in from the west (Botley Road) is the best option, since it provides a good route from both Witney and Abingdon. The main complication is that Botley Road provides access to a number of large retail outlets, and an industrial estate. It should be possible to use numberplate-recognition cameras to allow access from both sides but stop through traffic. Failing that, Botley Road can be closed at the city end. There is a risk that closing one route will lead to havoc on the remaining routes. It would be sensible to ensure that a robust package of alternatives is in place, including improvements to cycle routes in south Oxford (cycle lane on Abingdon Road, easier ramps up to the river bridge), and more bus services. But there are a very large number of journeys that could switch to public transport if the service can be made competitive, so the long term effect should be an overall reduction in congestion. Which would be a lot better than the current trend, where congestion is almost intolerable, and getting worse.